We had a very busy time at the prize draw event this weekend, and we’d like to thank everyone who came in to participate, especially those who were visiting the store for the first time. We hope you’ll come back and see us again often! Grand Prize winners: Simona and Linda S.
Second Prize winners: Trish, Bev, Angela, Sylvia, Jane O., Joan, Susan, and Linda S.
And once again, a big thank you to all of our distributors and suppliers. It was a lot of fun to give away so much beautiful yarn, needles, project bags, and knitting notions. Everything is running smoothly at the new store, and we are all as pleased as can be about the new location. If you have already been here for a visit, you will have recognized much – the same great choice of yarns, the same friendly atmosphere, the same welcome for those who’d like to sit and knit. 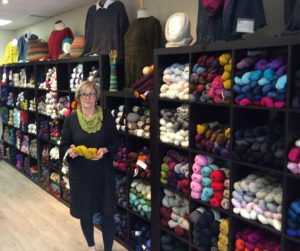 Everyone seems to like the new layout – it is easier to see what’s in the store, both yarns and sample garments. To celebrate our successful move and re-opening, we will be holding a grand gala prize draw for customers on Saturday, 8 July. Many of Nina’s wonderful suppliers have contributed prizes large and small, but including Fleece Artist and other top quality yarns, and a grand prize of a full Addi interchangeable needle set. Full contest rules will be available in the store, but all customers on Saturday 8 July who spend at least $20 will receive prize draw tickets. There will be multiple draws, with prizes grouped into value categories, and purchases over $100 will earn tickets for the grand prize draw. The draw will be held at the end of the day. You do not need to be present at the draw to win – come any time during the day, and you will receive draw ticket(s) with your purchase. So, if you have been thinking of a sweater project, or even just a pair of socks, Saturday 8 July would be a great time to buy your yarn. Everything is moved and in order; the store will be reopening at the new location tomorrow, Thursday 15 Jun, for normal business hours. Our move is underway, and the store is currently closed. Everything is on schedule to reopen at the new location (1213 Ellesmere) on Thursday, 15 Jun. We’ll see you soon! The really good news for our customers is that we will be having a huge “Farewell and See You Soon!” sale, in order to reduce inventory before the move, and to thank you all for your continuing business. Many yarns will be on clearance for 30 – 50% off regular price. Some regular yarns are on sale for 20 – 30% off. Books are on sale at 20% off. Best of all, every single one of our non-sale yarns, including new yarns and best-sellers, will be on sale for 10% off purchases over $100, 15% off purchases over $200, or 20% off purchases over $300. In all cases, you will receive a coupon for 10% off your first purchase at the new location. So, hurry along to the store to save big on purchases before we move, then see us soon at the new location, with another discount waiting to welcome you. We have a brand new class coming up soon – Trish Denhoed’s Crocheted Dragon Gloves on Saturday 13 May. This is a simple, fun, project class that makes optimal use of basic crochet skills and some colour-changing yarn. Join us, and be very impressed by these lovely gloves. Click here for more details. Trish Denhoed’s finishing techniques workshop is our most popular class, and probably also our most useful. Recommended for anyone who knits garments (or would like to) – learn how to manage seams, edges, and garment details neatly and professionally. The next session of this workshop will be on Saturday 1 April. Click here for more details. In this project class, we will begin the gloves then you can finish them at home. Lots of options for switching to knitting the arms, and for working the crocodile stitch further up the hand. We have another new yarn in the store. Fresco is an Italian linen-viscose blend, from Borgo DePazzi. It’s lightweight, has fantastic yardage, with a beautiful sheen, great drape, and just a bit of textural interest. We recommend a fairly loose gauge for light, airy summer garments & wraps, and the inexpensive price point makes it very suitable for larger garments. Nina has already worked up a sample scarf in silver-gray, but the possibilities are endless. Available in a range of solid and variegated colours. If you are planning to attend the Yarn Tasting event on Saturday, Fresco will be one of the yarns we’ll be ‘tasting’. Estelle Yarns are sponsoring a Spring ‘Yarn Tasting’ event at the store. Estelle will provide a range of new yarns for you to try out. Register for the event, bring your own needles, and come knit a few swatches with us. Decide what you like, check out the colours, and help us decide which we should stock. Estelle Yarns will be providing door prizes, and we will have tea, coffee and snacks available. Make sure to call the store (416-331-8085) to register for this event, as space is limited. Halo is a brand new hand-dyed yarn bundle offering from one of our favourite suppliers – Fleece Artist. Each bundle contains one skein of Merino Slim and one skein of Angel Hair (70% Kid Mohair, 30% Nylon), in matching dyelots. It is so new that we haven’t seen any stashed on Ravelry yet! But look at all the wonderful colourways currently in stock at the store! We think this would be wonderful to knit up into a garment with stripes of complementary textures (gauzy lace mohair striping with solid merino). There’s loads of yardage between the two skeins; two bundles would make a generous light top. 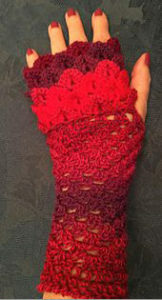 Or, hold the two strands together for a quick knit of something light, warm, and fluffy. This Autumn, Nina worked with Fleece Artist to create an exclusive, custom colourway for Creative Yarns. Samples were provided, colours were tweaked, and eventually we received a full order. Available now in the store, this luscious sock yarn knits up beautifully. Inspired by the Northern Lights, it uses some of Nina’s favourite colours. And every skein sold in the store comes with a free project bag, perfect for carrying a pair of socks-in-progress. This is an exciting announcement for those of us who admire all the wonderful sample garments Nina has around the store. We are having a sale of Nina’s handknit designs. Many of these amazing garments will be on sale – at very attractive prices – all this month. If there’s someone special in your life who deserves a beautiful, handknit gift this year, Nina might have something appropriate and ready made. We all know how much work goes into handmade garments. Normally, this means that unique, custom designs are well beyond our price range, if we don’t have the time (or skill) to make them ourselves. But this year we have a large selection of high quality designs available for little more than the cost of materials. Hurry in to see what is available. These are unique pieces, and when they’re gone, they’re gone! It is time for our fifth annual mini- sock Advent calendar. There’s one sock for each day of Advent (1 – 24 December), and each sock is stuffed with a delicious Lindor chocolate. The ‘sock of the day’ goes to the first customer of each day, or at least the first customer who remembers to ask, because the store does get busy in December, and sometimes it’s hard for Nina to remember what day it is! Nina also has a bag of additional mini-socks to give away to customers in December. Last year we saw some pretty fierce competition for mini-socks, so there are even more available this year – 75 of them, in addition to those on the Calendar. However, December is the busiest month of the year, and the mini-socks will still run out early. So, do your Christmas yarn shopping early for the best chance! The mini-socks are made by knitting instructor and Creative Yarns regular Mairi McKissock, from bits of leftover sock yarn donated to the cause this year by: Betty, Jane, Cathy, Trish, Jean, Phoebe, Corinne, Kathy, and Monika. Thank you, everyone, for joining in the fun of our December mini-sock tradition! Do you use Facebook? Nina now has a Facebook account, and she’s going to be using it to post occasional store news. Look for the ‘Find us on Facebook’ button at the right of the home page. Click on it to go directly to the Creative Yarns Facebook page. And be sure to send us a friend request if you’d like to see Nina’s updates in your Facebook feed. We hope everyone is enjoying their summer, but it’s not too early to plan ahead for your Fall knitting schedule! We have booked a full schedule of classes for September through December – you can browse here for what is available, or check out the class pages for all the details of the ones that interest you. Create your own modular masterpiece! Elizabeth will walk you step-by-step through the process of creating modular garments as you work on this stunning project over this four-session course. Unleash your creativity (and use up some of your yarn stash) with something new! Instructor Jane Bridgeman will teach you everything you need to know to get started with the traditional (but newly popular) craft of rug hooking. For those who missed it last time, Cristina is running her introductory Brioche workshop again. This is the place to start if you have ever admired those fascinatingly thick, soft, drapey, textured wonders of Brioche that we see so often these days. Warning! It’s addictive. Come to this Thursday evening workshop to learn the basics of working mosaic patterns, and get started on a simple cowl pattern, just in time for cooler weather. Expand your brioche knitting skills by applying new cast on and bind off methods, and learning to work in the round. Everything you need to know to get started with crochet, and get going on satisfying crochet projects. Swatching might be the least popular knitting activity there is. But learning to do it well could be the best investment you ever make in your knitting career. This is the second essential step to making your garments fit well. Learn to finish your knitted garments painlessly and professionally. These are essential skills for any knitter – blocking, seaming, tidying, fixing, and more. This is a project-oriented workshop that will get you started on a stash-busting rug project using the yarn you already have available. Everything you need to know to knit socks of any size, using the classic, top-down, heel-flap & round toe construction technique. This class is suitable for first-time sock knitters, but be sure to check the listing for prerequisite skills.